WALLA WALLA, Wash., August 9, 2017	(Newswire.com) - Taylor, a college student in Walla Walla, Washington, received a very special Autism Service Dog delivery today Service Dogs by Warren Retrievers. Based in Madison, Virginia, Service Dogs by Warren Retrievers, or "SDWR," has a mission to provide specially-bred and trained dogs for adults and children with invisible disabilities like Diabetes, PTSD, Seizure Disorders, or in the case of Taylor — Autism Spectrum Disorder. SDWR has almost 600 service dogs working across the U.S. and around the globe. SDWR is currently serving almost 1,000 families. 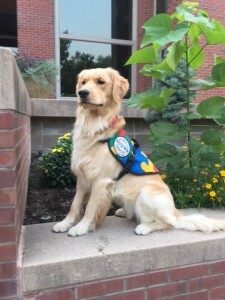 Bohach, a golden retriever Autism Service Dog, has already received thousands of hours of training through SDWR's service dog raiser program where volunteers raise puppies in training for about a period of one year. The dogs and raisers must follow through the foundation and skillset training provided through SDWR trainers at the facility in Virginia. Bohach is also a very special graduate of the SDWR Fallen Officer Puppy Program. The Fallen Officer Puppy Program, or "FOPP," is an initiative by SDWR to honor the legacy of service by American police who have fallen in the line of duty. Bohach is named in honor of fallen Police Officer John C. Bohach of Reno, Nevada who lost his life on duty due to gunfire. Bohach's Autism Service Dog work with Taylor will carry on in memoriam of Officer Bohach's life of service before self. Taylor has a complex set of challenges she faces each day. "My anxiety, panic attacks and meltdowns keep me from experiencing so much of life, as I have to structure so much of my life in order to avoid becoming overwhelmed," states Taylor about her need for a service dog. She was diagnosed with Autism Spectrum Disorder in elementary school and also carries a diagnosis of Sensory Processing Disorder and Panic Disorder. Challenges that Taylor faces with her Autism include depression, severe social anxiety and sensory overload. These are but a few of the common challenges of Autism Spectrum Disorder. Bohach will work with Taylor to reduce the effects each diagnosis has on her independence and daily life. BMJ Open, a public health medical journal, recently published research on the positive evidence of the difference a service dog can make in conjunction with Autism Therapy. The study indicated that recipients of a service dog showed improved safety from self-harm and wandering, greater communication ability, and a calmer demeanor. SDWR trainers work directly with each individual to provide service dogs that fit their unique diagnosis. With the arrival of Bohach, Taylor will have yet another tool, a four-legged one that has received training to assist her to live a happier and more enriching life. Since Bohach is a service dog and covered under laws in accordance with the Americans with Disabilities Act, he will be able to accompany Taylor everywhere — from restaurants to shopping to school. This training program is what sets SDWR apart from other non-profit service dog organizations. SDWR trainers will continue to return for training sessions with Taylor and Bohach for the next 18 months to work on his custom training commands. Service Dogs by Warren Retrievers is a non-profit organization based in Madison, Virginia, and relies on donations to help the Organization in its mission, "Until there's a cure…there's a dog." 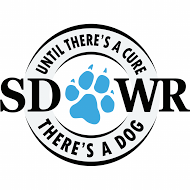 To make or donation or learn more about SDWR, please visit the website, http://www.sdwr.org. 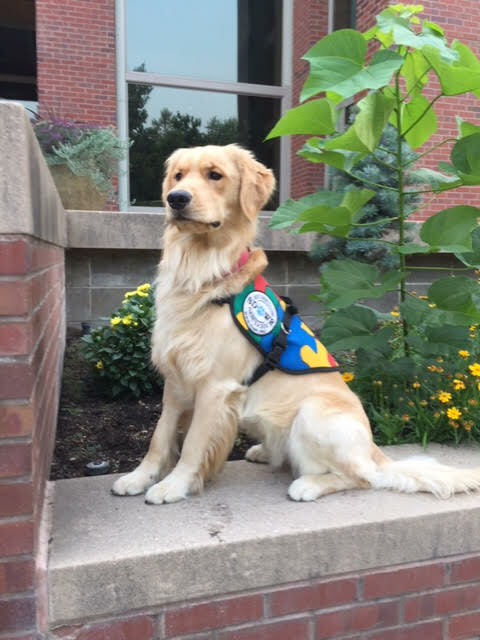 To learn more about Autism Service Dogs visit http://www.sdwr.org/service-dogs/autism. To find out how you can volunteer as a puppy raiser visit http://www.sdwr.org/volunteer-opportunities.